While a large wine cooler can be great to have in any home, there are often times when you might not have enough wine to fill one. In other cases you might not have much of a need for a massive cooler or you don’t have the physical space to get it stored in your home. That’s where a good countertop wine cooler can come in handy. This is exactly what the Danby Maitre’D DWC1233BL-SC wine cooler will do for you. This popular Maitre’D model is a small unit that is a little more than one and a half feet in height. You can use this to store up to twelve wine bottles at a time. You can use this in many spots around your home. In fact, it operates quite well without the use of refrigerants or the need to unplug it just to defrost the cooler. The most popular part of the DWC1233BL-SC cooler is that it can be stored in many spots. You can store this on a counter without worrying about it adding too much weight. That’s because it is only about 30 pounds in weight before the wine bottles are added. This can also fit into many spaces around the counter. It is 18 7/16 inches in height, 13 3/8 inches wide and 20 1/16 inches deep. You can even place this on a counter that is right under some added cabinets mounted on the wall if you have such a space in your home. Meanwhile, the main body is completely black while the glass door is thick and clear. This adds a more exciting look to the cooler. It is even accentuated with a blue LED light on the inside. You can activate it within the cooler to create a beautiful ambient look within the cooler. Best of all, you don’t have to worry about it causing any heat, what with LED lights being capable of illuminating spots without generating lots of heat. An important part of this Maitre’D model is that it is easy to use without placing the quality of your wine bottle at risk. First, it does not require the use of any potentially hazardous refrigerants. In addition, it uses a semiconductor-based cooling system, thus keeping it stable. In fact, you don’t have to worry about the possible threat of wine bottles shaking due to vibrations. This cooling system also keeps the sound down so you won’t have to worry about serious threats relating to your bottles. The temperature control system is also very easy to use. You only have to use a few buttons on the top part of the inside cooler to change the temperature around as you see fit. This operates at temperatures from 50 to 65 degrees Fahrenheit. It also uses one cooling zone. Of course, considering the size of the cooler, one cooling zone is all that you really need here. This also features an automatic defrosting system. That means that it will prevent frost from developing while also ensuring that the air will continue to be as consistent as possible. You can store wine quite well when you use this Maitre’D cooler. There are three chrome shelves on the inside of the cooler. You can store up to twelve bottles of water inside this cooler when you use these three shelves as well as the bottom part. There are also some contours on the shelves to keep the bottles from shifting while inside the cooler. Be aware though that these shelves cannot be removed or adjusted. You can use this for taking care of standard 750mL bottles. In addition, the design makes it to where you don’t have to worry about one bottle sticking out any further than necessary, thus ensuring that the cooler stays closed at all times. 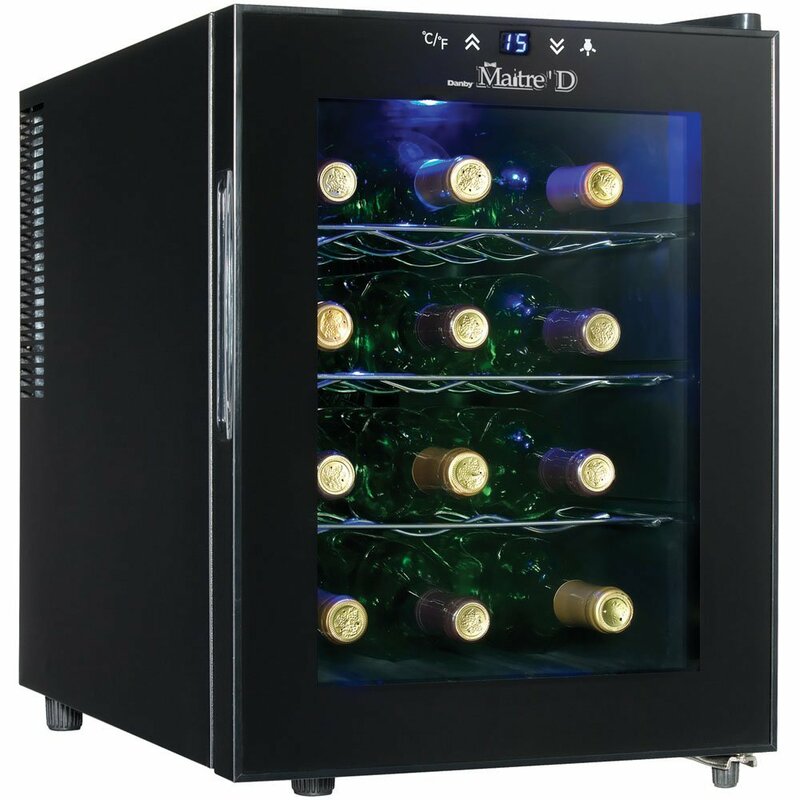 The Danby Maitre'D DWC1233BL-SC will be a great wine cooler to have if you only have a need to store a few bottles at a given time. You can use this to store plenty of wine bottles in a compact area. This is a very easy cooler to have in your home and will quickly give you the support that you deserve when finding a way to keep your wine protected.